Shawn Snyder has been building a variety of Predator head sculptures for a couple of years, but when he brought an early version of his latest to a SEALUG meeting a few months back, I knew it was going to become my favorite. The completed sculpture was worth the wait, and even better than I imagined. Expanding on his fearsome Predator head design, Shawn incorporates brick-built skulls, bones, and body armor to complete the look. WOW!!!! 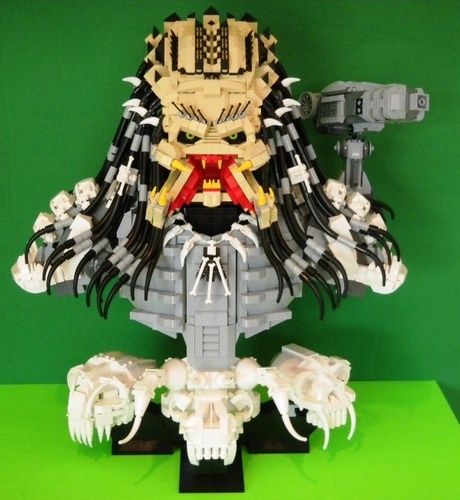 This is the best predator moc Ive ever laid eyes on hands down. Yeah, I’ve seen misterzumbis design also. It’s based off of this guy Shawn snyders original design. Which he’s clearly updated himself.